The Hamilton Island Beach Club is an over 18 luxury resort that provides holiday makers with a remarkable and memorable place to stay in the Whitsunday Islands. By choosing this resort for you next holiday you will be able to wake up to absolute beachfront views and be surrounded by landscaped gardens right on Hamilton Island's beautiful Catseye Beach. The Hamilton Island Beach Club prides itself on providing a romantic and intimate setting with luxuriously appointed hotel rooms that are perfect for couples. All of the rooms at the Hamilton Island Beach Club overlook the palm fringed Catseye Beach and the Coral Sea and have their very own private courtyard or balcony. The resort facilities at the Beach Club Hotel include an infinity-edge swimming pool, private beach area in front of the hotel, a poolside restaurant, lounge bar, in-house library, room service, 24 hour reception, internet access, daily housekeeping and much, much more. Guests staying at the Hamilton Island Beach Club will also have free use of non-motorised water sports including windsurfing and snorkelling equipment, the island's gymnasium, spa, sauna, tennis and squash courts. 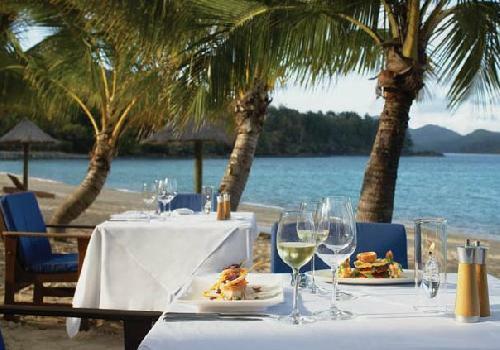 There are more than 60 activities that guests who stay at the Hamilton Island Beach Club can choose from. These include beach and watersports like snorkelling the coral of the Great Barrier Reef, diving with tropical fish, playing beach games and sea kayaking, sailing, bushwalking or enjoying a soothing spa treatment, day trips and exciting excursions to Whitehaven Beach and the beauty of the Whitsunday Islands, golf at the Hamilton Island Golf Club on neighbouring Dent Island, go-kart racing, quad biking, mini golf, visiting the Hamilton Island shooting range or working out at the island's fully equipped gymnasium.